King Leopold I of the Belgians was the beloved Uncle of Queen Victoria, her advisor and mentor during her early reign and the man who encouraged her marriage to his nephew, Albert. Everyone knows about his marriage to the daughter of the Prince Regent, Princess Charlotte, whose tragic death followed a scandalous mis-management of her pregnancy. 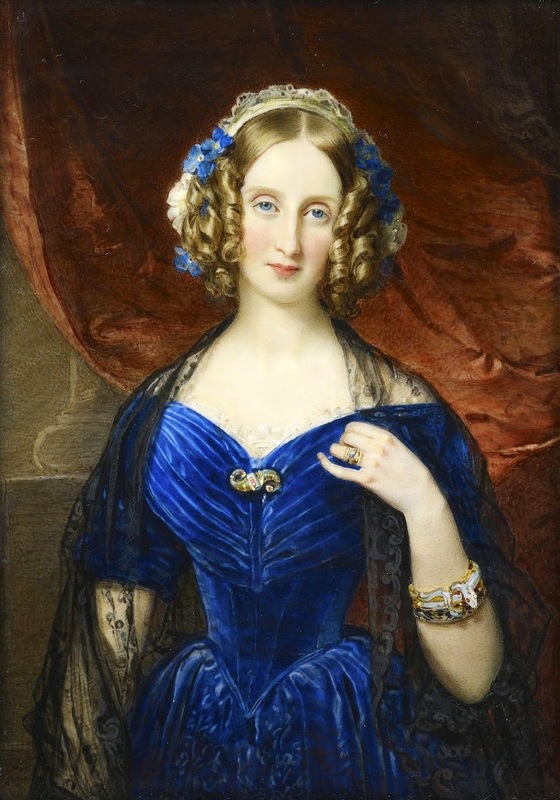 Leopold was invited to take the Belgian throne, but what about his less known second wife whom he married on 9th August 1832? 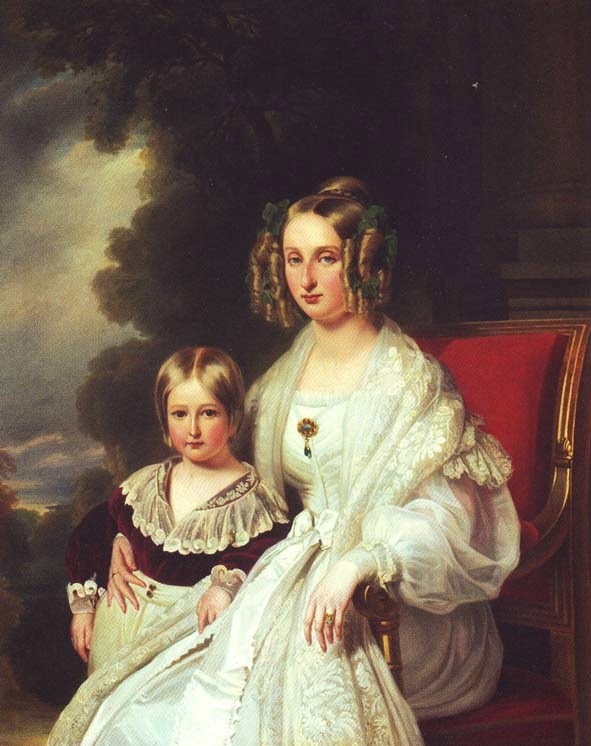 The eldest daughter of the King of the French, Princess Louise-Marie Therese Charlotte Isabelle d'Orleans, was a descendant of Philippe d'Orléans, Regent for Louis XV, Madame de Montespan, and of Louis XIV and Philippe I, Duke of Orléans both sons of Louis XIII on her father’s side, and on mother's a descendant of Maria Theresa of Austria and Catherine de' Medici. Blonde, fair skinned, blue-eyed Louise Marie was a shy, innocent girl who dreaded the idea of becoming Queen, weeping constantly at the thought of separation from her family. Leopold was a handsome seasoned soldier and statesman, a widower and an experienced lover of forty-two, an ambitious man of the world, somewhat hardened by past sorrows and disappointments. He was also a Lutheran, and, reputedly, a Freemason, she a devout and pious Catholic. Leopold confided to a friend, "I'm delighted with my good little Queen: she is the sweetest creature you ever saw, and she has plenty of spirit." Despite her initial reluctance, Louise-Marie fell deeply in love with her husband and became a devoted wife and loving mother. Very shy, she was only seen in public when Leopold insisted, but she became very popular at the Belgian court with her generosity and beauty. In the early 1830’s, Flanders was stricken by famine and poverty ran rampant through Belgium. Louise-Marie was patroness of many philanthropic, religious and educational institutions. Her friends, servants and entourage knew her as a gentle and forgiving mistress whose charity was ‘inexhaustible’, and her popularity grew in direct proportion to criticism for Leopold’s infidelities. When a farmer said in her hearing that he admired a pedigree cow and that one like that would transform his life, Louise-Marie allegedly sent him two of the creatures as a gift. When people heard a tale of hardship, they exclaimed: "If only the Queen knew!" which after her death became: "If only the Queen were still alive!" 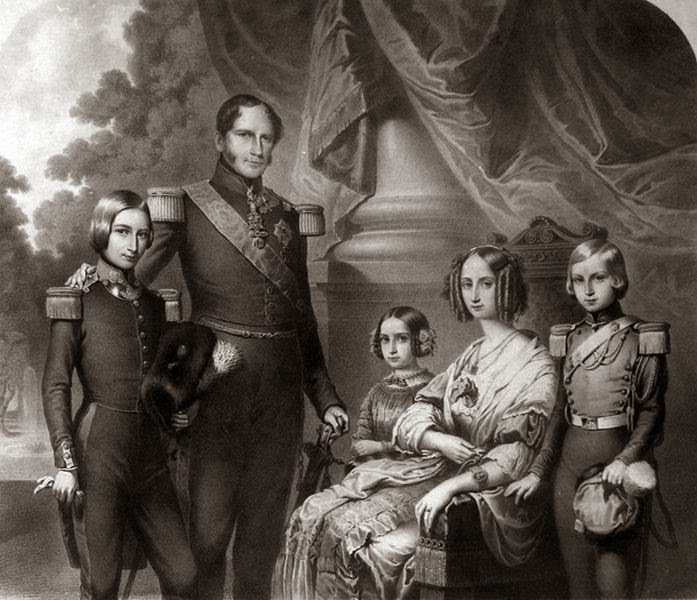 Leopold and Louise-Marie had four children: Louis-Philippe in 1833 who died a year after his birth, Philippe Eugene [1837-1905] whose son Albert I was the third King of Belgians and reigned during World War I, and Marie-Charlotte [1840-1927] who married Archduke Maximilian I of Austria and became the Empress of Mexico. Leopold was instrumental is arranging the marriage of his niece, Queen Victoria, the daughter of his sister, Princess Victoria of Saxe-Coburg-Saalfeld and Edward Duke of Kent, to his nephew, Prince Albert, son of his brother, Duke Ernest I. Leopold had offered Victoria advice in the early days of her monarchy, although she asserted her independence early in her reign. After the Revolution of February 1648, Queen Louise-Marie’s father, King Louis Philippe, abdicated and his family fled to England. They lived at Cleremont, where the exiled king died in August 1850. 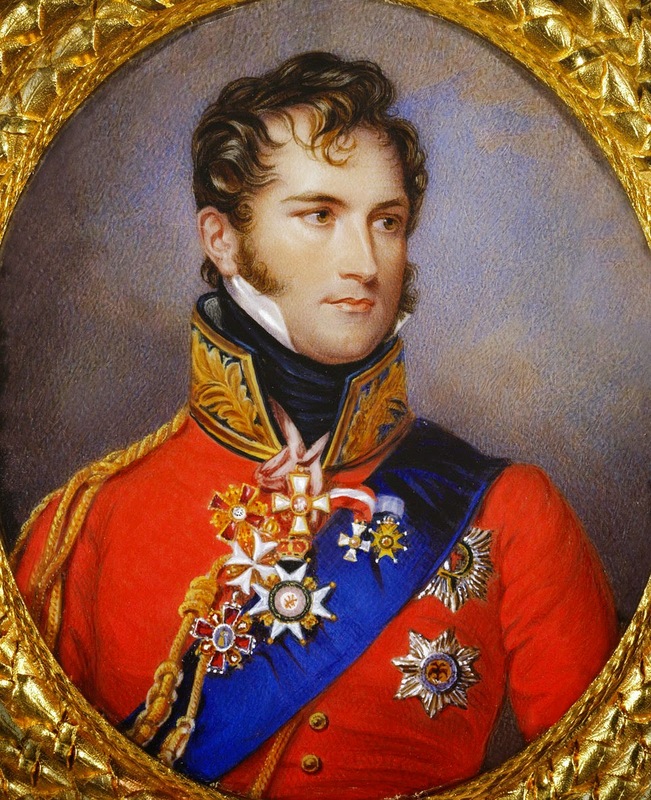 The death of Louise-Marie’s brother, Ferdinand-Philippe, Duc d'Orléans in a coaching accident at the age of 31, and of her sister the Princess Marie of consumption at 25, had been terrible blows, as had the loss of her first born son at a year old. By this time, Louise-Marie was very ill with consumption. She died in Ostend two months later, on 11 October 1850 at the age of 38. She is buried beside her husband in Royal Crypt of the Church of Our Lady of Laken. King Leopold never returned Louise Marie’s passionate devotion and wasn’t faithful, but he sincerely mourned his consort and paid her this touching tribute: "Her death was saintly, like her life." "Charlotte...Charlotte..." although no one was sure as to whether he was calling to his daughter, the Empress of Mexico, or to his first wife, Princess Charlotte. "In the name of the love you bear for the Queen's memory," said his daughter-in-law Marie-Henriette the wife of Leopold II, "will you not be converted to her religion so that you may meet her again in Heaven?" "Nein..." he whispered, then died. I'm inclined to think it was his first wife he called for, as before she died, Princess Charlotte asked that Leopold be buried beside her when his time came. Leopold had a space made for him in her tomb in St George’s Chapel at Windsor, reminding Queen Victoria of his wish just before he died. A wish which strangely, was not granted. 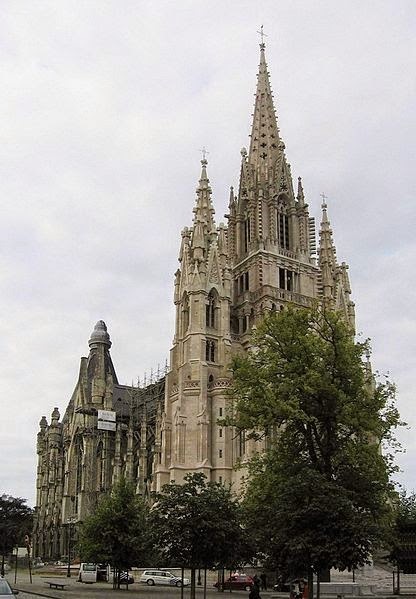 For further information, I recommend an excellent blog called, The Cross of Laeken, which covers many aspects of the Catholic Belgian Royal Family from its origins to the present day. Awesome post, Anita! Thanks for telling us about this fascinating woman. but never knew all this. Thank you both for your comments. I literally stumbled across her and felt great sadness for her fate. She was a beautiful, lovely young woman whose life was too short and too troubled. Being royal wasn't the answer to happiness was it?